Tag Archive | "West Howard City Road"
A Morley woman who hit another vehicle from behind Friday morning in Reynolds Township may have been distracted by one of her children trying to loosen their seat belt. According to the Montcalm County Sheriff Department, the crash occurred about 9:39 a.m. on Friday, June 16, in the 22000 block of West Howard City Road (M-82). 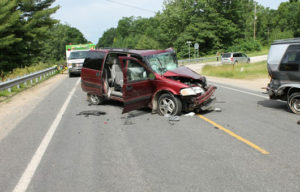 Police said that Vanessa Dyer, aged 25 from Morley, was travelling eastbound on Howard City Road (M-82) in her 2003 Chevrolet minivan with her three children, ages 2, 3, and 4. Joseph White, aged 61 from Muskegon, was travelling eastbound in front of Dyer, in his 1989 Chevrolet van. White was slowing to wait for traffic to clear so he could make a left turn into a private drive. A westbound 2000 Chevrolet Tracker, driven by Carl McNees, age 65, from Sand Lake, was slowing to make a right turn into the same private drive. Dyer told police she was distracted by her children and did not realize White was slowing on the roadway. Dyer struck White’s vehicle from behind causing White’s vehicle to strike McNees’ vehicle. Dyer was pinned in her vehicle and the Jaws of Life had to be used to remove her. She suffered serious injuries and was flown to Spectrum Butterworth in Grand Rapids by Aeromed. Dyer’s three children were transported via ambulance to Spectrum for observation. White was not injured in the crash. His wife, Gloria aged 56, was a passenger and was complaining of injuries. She sought her own medical treatment. McNee sustained minor injuries during the crash and refused treatment. His wife, Donna, aged 63, was passenger and was not injured. In addition to Aeromed, ambulances from the Montcalm County Emergency Medical Services and Life EMS assisted at the scene, as did the Howard City Fire Department. Police believe that one of the Dyer children was attempting to undo his seat belt in the vehicle. 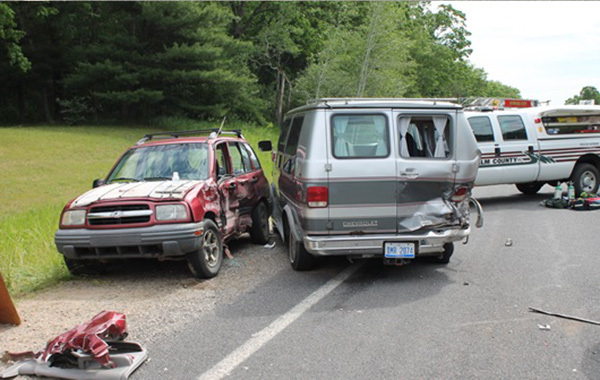 However, the remaining occupants, and the occupants of the other vehicles, were properly restrained and there were no other known contributing factors that led to the collision.